Last Saturday, Kristen and I walked downtown to check out a relatively new pop-up market. Originally, SOLstreet was just an online platform to purchase all kinds of locally made products (check out their market page!). But now they have started to host a monthly pop-up shop here in NYC as well so that you can go check it out in person! This was their second event and I’m looking forward to the next one already. Handmade decorative fiber arts by Gabrielle Mitchell – shop on etsy! While you shopped sustainable fashion and check out handmade products from local NYC vendors, the location (Pourt Cafe) also offered $5 wine & beer. Awesome. Really cool jewelry by Jennifer Rabinowitz at Left Angle. We actually spent a lot of time talking with Derya, the founder of Anatoli, learning about these beautiful handmade Turkish towels. She and her partner, Fotis, work with families in the villages of Anatolia who have been weaving for generations. 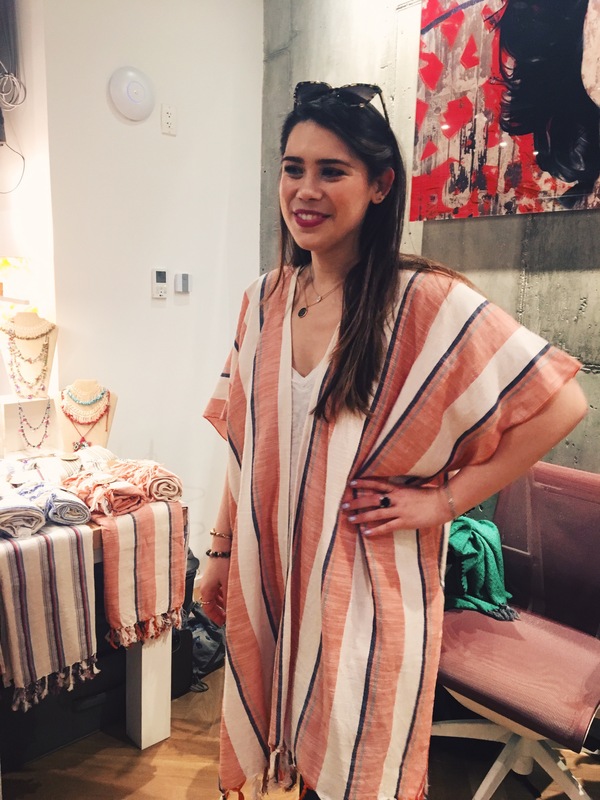 Kristen bought this gorgeous kaftan ^^ and I bought this Turkish towel (which I’m currently using as a wrap/scarf while I write this post!!). The towel is really versatile and can be used as: a towel (duh), a scarf, a shawl, or a blanket. The towel (and all other products) is hand-woven by local artisans in Turkey using 100% cotton threads in the authentic traditional technique, so the material dries super quickly and is perfect for everyday use. Accessories for you + your home by Lun Made. Those coasters are SO cute. I’ll definitely be back for their pop-up in June! I’m always looking for things to do around NYC, so I’ll post more information for anyone who wants to go too! Beautiful pics! I need to visit NYC for the next one!